This is the third post documenting a recent visit to Digital Accessibility Centre in Neath, South Wales organised by fellow team member Siobhan Bamber. The first post can be found here, and the second post here. In this post we take feedback from Carly who is totally blind. She showed us how she used a screen reader and gave us some great feedback on using the WordPress admin screens with a screen reader. Carly is blind and uses screen readers to access websites – usually JAWs but also NVDA. She tried out the admin with JAWS – it’s all we had time for. She showed us both browsing in context and out of context. In context means getting the screen reader to read text, links etc whilst moving around the page. 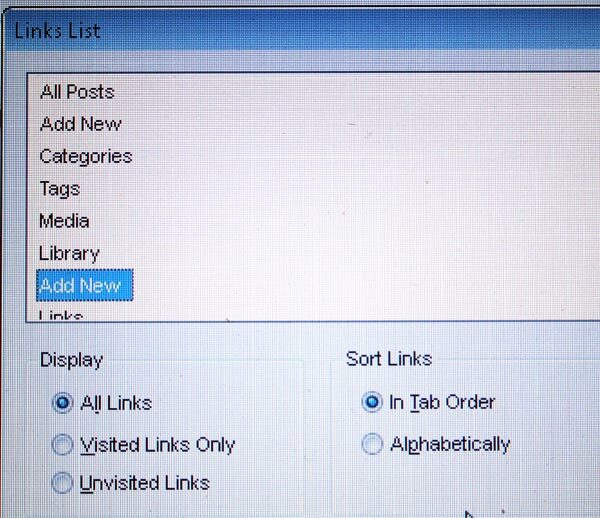 Out of context means using the screen reader commands to list all links, buttons, headings etc on a page. This latter method is extensively used by blind people. Listing headings on the page reveals the page structure. Carly indicated that she thought getting the heading hierarchy right was important as it indicates to screen reader users how the content fits together. When adding tags in a new post, screen readers need to have audible feedback that they’ve been added. Same with Post Added/Published etc. Audible feedback would also be useful in the Custom menu area to identify when items have been added to a menu, or when the menu hierarchy has changed. If a screen reader user uploads an image or media file with the 3.8 Add Media panel it is possible to add it into a page/post if it’s all done in one step. We asked Carly to upload a PDF file and make a link to it from a page. She was able to upload the file but couldn’t work out how to successfully place a link to it on a page. Carly’s inability to complete this points up that some instructions are required – even for sighted users this actual task can be a bit confusing. See note in first post about accessibility pages. As we know, doing anything else in the Add Media panel with a screen reader and keyboard only operation is not currently possible. Carly had a go at creating and manipulating a custom menu. Instructions would really be needed here – I had to explain how to do it. She says that it needs audible feedback that menu items have been added, or hierarchy changed etc (see above). On my suggestion, Carly briefly tried the accessibility mode in the Widgets area. She was able to manipulate widget options, but things got difficult when we got to the table where she could influence the positioning of the widget within the available widget areas. The combination of the radio buttons and dropdowns in the table was confusing and there were no real instructions (help required). Carly didn’t really know what was expected of her – even with me explaining – as the context for the dropdowns (selects) is provided by the table column heading and the adjacent radio button instead of a true label. Just this brief exploration of the WordPress Admin area with three people with impairments and their assistive technology has yielded some important lessons, and pointed out some ways that WordPress accessibility can be improved. I’m hoping that we can post some proposals for our ongoing accessibility strategies here soon. It is important to let people know when a new panel or window is to open – eg Add Media. Graham, this is sheer gold. I hope we can chat about this in the next IRC meeting. Thanks again for everything you’ve done here.